at work i’m using mysql replication quite extensively. first it was a straightforward one-way replication that has been rock-solid for us since 2009. in 2012, for another type of data, we’ve started using master-master setup. initially the servers were in different European countries, eventually the secondary site was moved to North America while primary one remained in Europe. i’ve described the setup in this post. clients periodically select preferred site based on the lowest response time. their request generate simple read/write queries; updates get asynchronously replicated between both sites. if you google about similar setup you’ll find a lot of warnings – this architecture might lead to inconsistency when contradicting updates arrive nearly at the same time to both sites. in our case it’s highly unlikely. also, we have extensive monitoring and alerting based on pt-table-checksum and a simple automated conflict resolution script. it has worked very well for us and gave multi-year 100% service availability also in a few events of network outages affecting either of the datacenters. 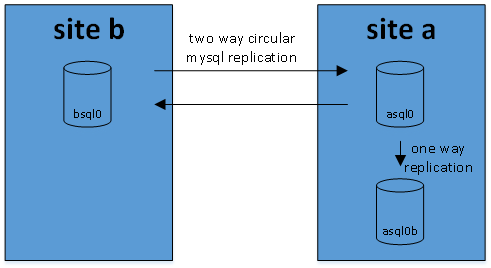 in this setup asql0 is using multi-source replication – a mechanism that is available since mysql 5.7. it fetches and replies binlogs from both bsql0 and csql0; thanks to the log-slave-updates directive it also acts as replication master for asql0b that collects all updates done to asql0, bsql0, csql0. this simple mechanism allows us to withstand failure of site a – in the worst case all of the users will switch to the site b.